That’s the name of my hardcover franchise book. The editors at Wiley Publishing, a publisher known for producing top small business books, contacted me after reading a review I wrote about another book-The Rise To The Top, by David Siteman Garland. You Can Become A Franchise Owner! You just have to do it in a methodical way. My franchise book offers several useful things that anyone looking at franchising will find helpful. To date, there are 50+ reviews on the Amazon.com website. I’m very grateful for those reviews, and the support I’ve received from the franchise and small business community. A few months after my franchise book came out, I was contacted by the editorial team at Entrepreneur Magazine. They wanted to do a feature interview for their magazine. If you want to learn all there is about choosing, purchasing, and buying a franchise business, grab my book! Thousands of others already have. “Thinking about a franchise it’s a huge decision! Looking around the Internet or have some rough idea? Well absolutely do yourself a favor and buy this book. An excellent comprehensive overview from a very knowledgeable party. 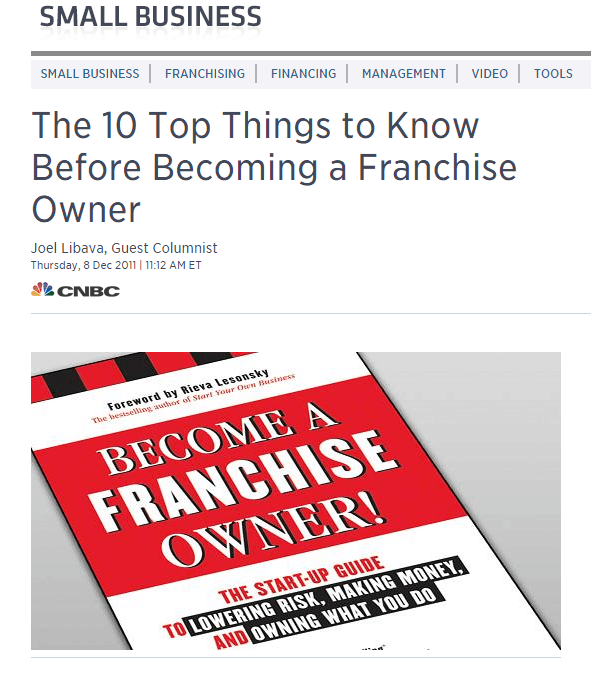 Joel Libava The author, otherwise known as the franchise king, online, gives you extensive information on how to evaluate a franchise. Questions specifically to ask. How to narrow down your selection. And how to minimize your risk and get the information you need. Filled with a logical process, excellent ideas and numerous resources.